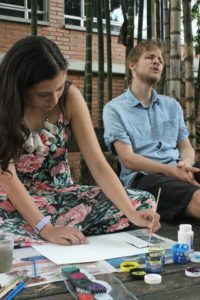 Luis, a Colombian grass movements activist, came up with this technique to help participants of RecrearMagnify 2016 (Medellín, Colombia) reflect on what the two weeks of cohabiting meant to them. For the group, the exercise represented a way to reflect both individually and collectively on the meaning of our work together. We used this technique to understand how participants experienced a collective process. This being said, the technique can also be used to understand how a group relates to their shared spaces, community relationships, or any other shared area of interest. The paintings and storytelling that goes with it, help the researcher(s) to process and analyze the situation. This technique uses painting as a means to listen and capture each other’s ideas. There are no right and wrong answers. Instead the exercises ask people to engage their in listening and then process what they hear through art. Creativity is an incredible channel to learn together; in this exercise creativity comes across in the painting as well in making sense of the painting’s symbolism. Community building, problem identification, data analysis. You need paper to paint on, newspaper to place below on the floor, watercolors/acrylics/pastels/etc, paint brushes, and glasses of water to clean the paint brushes. Make sure to have enough material for the size of the group. It’s helpful to have something to keep time with. If participants are sitting on the floor, you might want to add some cushions for comfort. Organization of space and logistics: Prepare the workshop space, placing all the materials in the space/where you want them to be/where they belong?. 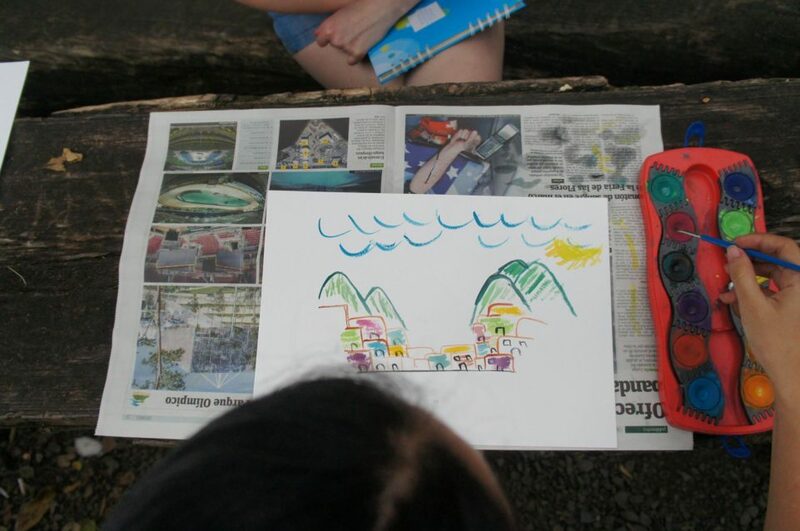 The workshop: Explain that the exercise will be used to reflect and share about a certain issue/experience. Divide the group into pairs. Each pair has to decide who starts sharing and who will be listening and painting first. Invite the pairs to sit back-to-back. One partner will share their story while the other person listens in silence and paints. Point out that the silence of the painter is important for the exercise. After 10 minutes, ask pairs to switch roles in silence. As partners switch, it is important to emphasize that people should continue painting over what is already on the paper (although if they need more space you can provide more material). What’s important here is that they continue to paint on the canvas and interact with what was started by the first painter so that the in the end you will have one painting representing both participants. Afterwards, each pair will share and explain the painting’s symbolism to each other. At this point the pairs can step out of the back-to-back position. Finally, the group comes together to share the paintings and their experience in the process. This follows with a group discussion. It’s worthwhile doing an audio/video recording of the process – especially the discussion since there’s a lot of reflections that come out at the very end. The main benefit of this technique is the space for reflection it creates. This happens at three different levels. First with the individual reflecting about their experience, second with the other person listening and painting and lastly when the pair contemplates their collective painting. The technique also complements verbal with nonverbal forms of communication, thereby broadening how individuals reflect about their experience. The option of using colors also sparks creativity and activates a different part of the brain. Participants might feel intimidated to paint if they don’t consider themselves a good artist. It’s important to state at the beginning that they should not be worried about what the painting looks like. What’s important is that they try to represent what they hear by painting. Since pairs are not talking, the person who is speaking can forget that someone is painting what they hear. The facilitator can gently speak reminders to the group to speak slowly and pause occasionally. Encourage people to be daring: You should encourage participants to speak without fear and to paint without thinking about the outcome. You don’t need to be a great artist to have fun and learn from this exercise!